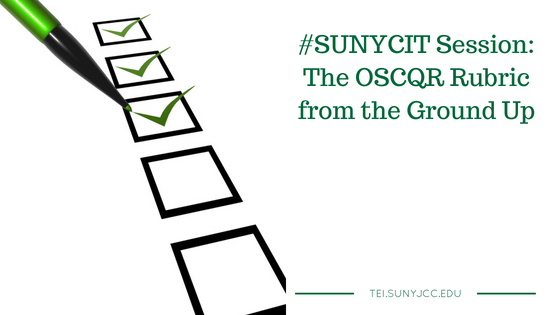 During the 2015 SUNY Conference on Instruction and Technology, I sat in on two sessions dedicated to the Open SUNY COTE Quality Review (OSCQR) model. The first session addressed the OSCQR rubric, and the second addressed the process. Open SUNY COTE is responsible for Course Support. Course Support is a COTE Framework for course review and course refresh. It is for improving courses. It is for improving courses. To ensure that all online courses are regularly reviewed and refreshed to reflect campus guidelines and research-based best practices. Open SUNY+ expects courses to be refreshed and reviewed. The OSCQR rubric is to standardize the process. There are two parts to OSCQR: a design rubric and an accessibility rubric. The team that created the OSCQR rubric based it on the Chico rubric. The Chico rubric was a California rubric with creative commons licensing. They then applied SUNY Learning Network best practices and SUNY campuses provided input. The team conducted a quality analysis against Quality Matters, INACOL, and Bb Exemplary Courses. The team used a comparable process when they added accessibility standards. The OSCQR is built using Google Docs. It has 37 discrete standards for instructional design and 37 discrete standards for web accessibility. It is also mapped to COTE Fundamental Competencies for Online Teaching. The rubric is flexible, non-evaluative, and focused on improvement. No score is generated. It is a formative instrument. The sole intent of OSCQR is to help identify how a course can be improved during the course refresh process. This rubric looks only on the instructional design of a course. ALignment of course objectives, learning activities, assessments, social presence, cognitive presence, teaching presence, etc. The rubric looks at the course through the learner’s perspective for elements like navigation, pacing, content presentation, and accessibility. The rubric also provides ideas for implementing the standard. Reviews are conducted on copies of courses (no student activity). Campuses create and manage their own OSCQR rubrics. They can also modify the rubric or create a separate rubric. It is possible to have separate rubrics for departments. Seven principles for good practice in undergraduate education. Based on the SUNY Institutional Readiness Program and OLC Quality Scorecard. We (instructional designers, Open SUNY, etc.) cannot tell people what to do. However, there needs to be a plan in place to refresh and review courses. A self-review instance of the OSCQR rubric can be created at their self-service site. You will need a working email address to access the assessment form. Rubric remains private unless shared; however, it is hard to share results. The rubric will offer suggestions for improvement. Accessibility rubric helps to stay within the law. You can hand out the tool to instructors as a guide to be used when they develop their courses. in this model, instructional designers and faculty review the course. They then sit down and compare notes and share ideas for improving the course. The faculty member, an instructional designer, and a third party member review the course. This third party member can be a librarian, instructional designer, colleague, etc. They are viewing it from a student perspective. External input promotes objectivity and more robust action plans. The outside reviewer has fewer standards to review. All feedback is aggregated into a narrative. Feedback can be sorted. Open SUNY+ expects courses to be refreshed and reviewed. When OSCQR is being managed across the entire institution, a dashboard can be created. The dashboard can aid the administrator to see where a course is in the review and refresh process. The dashboard also reports aggregate strengths and weaknesses of all courses. Personally, I think this is a great tool to help design better courses. SUNY JCC is currently exploring how to implement OSCQR across the college.